As a Product Designer at Percolate with a background in architecture, I’ve seen many parallels between the two fields. In previous posts, we discussed the importance of Circulation and Program to both architecture and product design. For the third post in the series, we’ll chat about hand-drawing, and learn how we apply architecture tools to product design at Percolate. In my first year of architecture school, I was required to produce all diagrams, sketches, and drawings by hand. Although this felt tedious at times, it taught me the value of sketching. 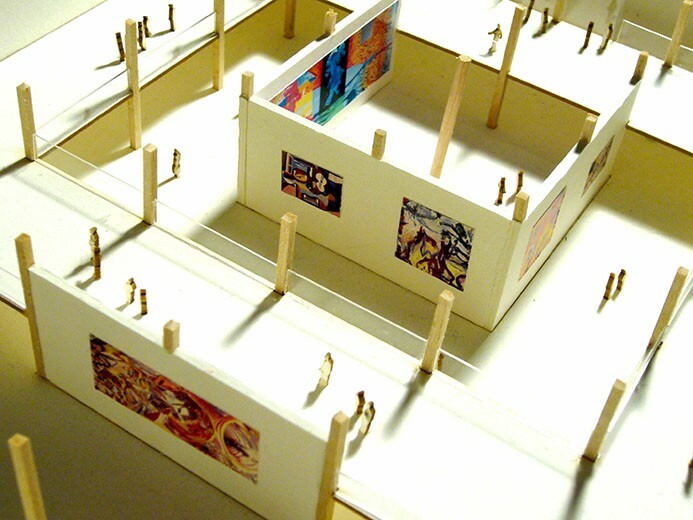 Architects are taught that there’s no better way to explore a design idea than with paper and a pen or pencil. Any degree of computer interaction can cause you to lose your train of thought. The time it takes to turn on your computer, open Photoshop, or even move the mouse, is enough time for the idea to get lost. I must admit that in the beginning, sketching felt hard. I focused too much on the straightness of lines, or the proportionality of objects. I’m so thankful architecture school forced me to practice. As with many things, the goal of practicing sketching is not to become “perfect” but to become more comfortable. The more comfortable you are with sketching, the easier it is to focus on relaying the idea, rather than the act of drawing. There’s no way to draw buildings at 1:1 scale. As a result, architects learn to draw so that 1 inch on the drawing equals an actual distance. For example, 1 inch may equal 10 feet in real life. Drawing with semi-transparent trace paper on a 1 inch gridded mat makes it easy for architects to draw to scale. Unlike architects, product designers have the luxury of drawing at 1:1 scale. Recognizing the size of a screen in inches, then drawing on a 1 inch cutting mat is a useful way for product designers to draw at scale early in the design process. This is important because it allows designers to more easily test design patterns and components. Within buildings, many design elements repeat, such as stairs which carry through from from floor-to-floor. When sketching, the semi-transparency of trace paper makes it easy for architects to layer drawings and trace common elements. Similarly for product design, when drawing sequences of screens, it’s valuable to sketch a design, then overlay a new piece of trace paper and carry through consistent elements such as navigation. In addition to duplicating common elements, the semi-transparency of trace paper makes it easy to iterate. An architect might overlay trace and change one element to show an alternate design. This is equally as relevant to product design. Iterations are an important part of the sketching phase of a project to quickly explore different concepts. Architects learn that the underlying structure of most buildings is a structural grid of columns. The grid allows for a more even distribution of weight and is an important part of what makes the building stand. The underlying grid also helps architects create organized designs. As a result, architects learn to sketch on a gridded mat so that they can easily keep the column grid in mind as they design. Percolate product designers also follow a grid system on web and mobile. As with architecture, the grid helps the product design team create well organized designs. Additionally, it helps us stay aligned with common styles and patterns. As designs move into development, our engineers appreciate the grid and patterns because it allows them to build reusable modules. The gridded mat helps product designers integrate the grid into early stages of the design process. Architects learn that straight lines are an important part of correctly relaying a design concept. On the first day of Drawing 101 class in architecture school, I was asked to draw horizontal straight lines, down 24″ x 36″ paper, at varying degrees apart. 1 inch apart, ½ inch apart and so on. It was slightly painful, but the goal was to become comfortable drawing straight lines. At Percolate, product designers understand that straight lines are an important part of respecting craft. Every detail counts and contributes towards the level of confidence in both a designer and their reviewers. An additional benefit for product designers is that layering trace paper is also a great way to show product states such as drop downs. Drawing the dropdown as closed on a base layer of trace, then placing an opened state on top is a useful way to explain the interaction. When drawing with trace paper and cutting mats, architects learn to sketch with Micron pens and Prismacolor (Prisma) markers. There are a couple reasons why these specific brands work so well. Microns and Prismas dry fast and have limited bleeding on trace paper. Microns are opaque, but Prisma markers are semi-transparent, thus allowing the designer to add color or shading, while still being able to see through the paper. Microns are particularly useful because they come in a variety of line weights. Similarly Prisma markers also come in two line weights. One end of the marker is thin, while the other is thick. In architecture, we learn to use line weights to depict depth in objects. When drawing a building, thicker lines are to be used to denote a lot of depth, such as the outside of a building. Thin lines are used to denote less depth, such as the outline of a brick on a facade. To the viewer, these varied line weights help relay the picture. Many product designers are familiar with the work Google has done on Material Design, which emphasizes particular layers, edges and shadows as metaphors for designing apps. If you’re playing with Material Design, or a bit of skeuomorphism, line weights are very useful for showing depth. Microns are also good for design annotations. A designer might use a thicker Micron for an H1 and a thinner Micron for an H3. For architects, color is most valuable for renderings such as building facades or perspectives. Black and white are good for shading plans and sections. 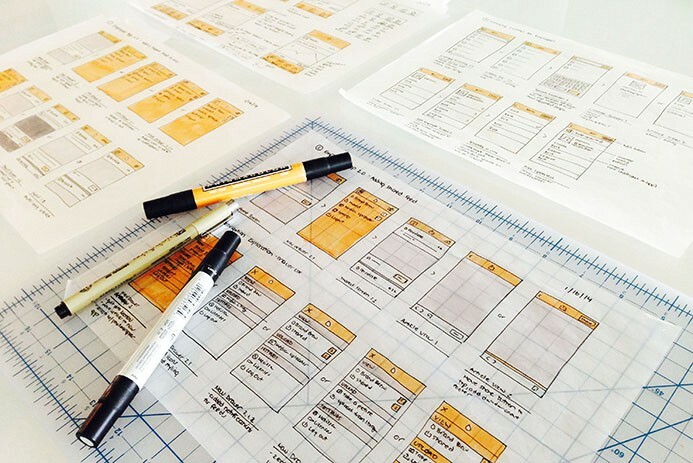 Percolate product designers like to sketch in grayscale with a touch of our signature orange. Prisma markers are particularly useful because they come in wide variety of colors with varying percentages of darkness. At the office, we have a number of Prismas at varying shades which we use to mark elements as foreground or background. Last but not least, I’d like to mention painter’s tape is particularly useful when sketching with trace paper. The tape has enough stickiness to hold designs in place, and can be removed without ripping the trace paper (unlike masking tape). The tape can be used to hold trace in place on the gridded mat. It can also be used for hanging designs on the wall — a great way for teams to review the designs. When reviewing, be sure to keep extra trace and pens at hand. Team members can easily tape a new piece of trace on top of the design and add comments or iterations. Trace paper sketching solved two challenges with the standard paper approach; one was having to redraw the same elements over and over. The other was that we couldn’t easily show drop down menus etc. Trace paper iterations really gave me the flexibility to better visualize my ideas. Looking to gift these tools for the holidays? Here’s a handy checklist of what to buy and where you can get it. Give the tools a try and let us know what you think. You can follow me on Twitter at @lissalauren. Thanks for reading! Look for more posts in this series coming soon. Looking for a design job in NYC? Percolate Design is hiring! Say hello. A version of this article originally appeared on the Percolate Blog. Lessons learned from an architect turned product designer.